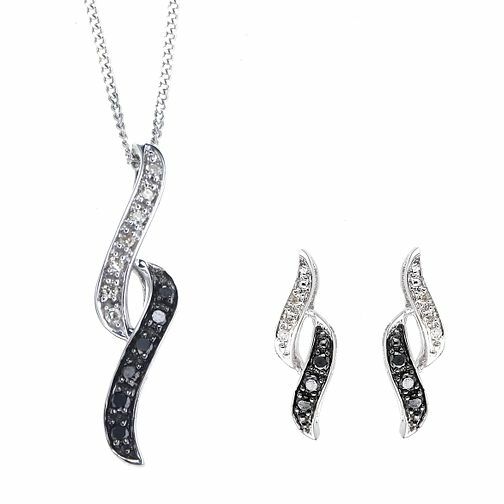 Glamorous and fashionable, this stunning diamond jewellery set features treated black and white diamonds set in an elegant wave design. Earrings height 15mm, width 5mm. Pendant heigth 21mm, length 460mm, width 6mm. 9ct white gold white & treated black diamond jewellery set is rated 5.0 out of 5 by 1. Rated 5 out of 5 by Anonymous from Delicate and sophisticated, goes with many outfits Gorgeous set which was a gift chosen by my boyfriend. Perfect choice.